Yesterday, I took my youngest shopping at Target. Over the last few days I’ve decluttered just about every piece of clothing the kid owns. Target is a good place to find her some new duds. She’s at that age where she’s too big and too old for children’s clothes, but not really old enough to be wearing “junior” sizes. Some of the stuff is just too “grown-up” for a twelve year old (in my opinion – not judging how anyone chooses to dress their child). Being an adult comes soon enough – I’m not going to rush it. Anyway, they were changing out their displays and getting ready for the imminent holiday season (sarcasm intended). I still haven’t pulled out my Halloween decorations (both of them). Armed with my one-hour-a-week, part-time teacher’s paycheck, we started shopping. Luckily they had just put a ton of stuff on clearance. We were able to get some cute clothing at a not too outrageous price. Still, I said “no” a lot more than I was happy about. She never complained and didn’t ask for anything outrageous, but it’s just hard for me not to give her everything she wants. I’ll spare you the rest of the conversation by the voices in my head. That’s my love/hate relationship with Target. I shop there, but not too often. I love a lot of their stuff and I want to buy it. I just know that it will make my house prettier, me look better, my life easier. Those curtains, that picture, that journal, those organizational supplies, those cleaning products that smell so good… All my problems solved. Lies! Lies that marketing works so hard to convince me of and lies that I tell myself. My house will be prettier if I keep it uncluttered, tidy and clean. I will look better if I am less stressed and can find clean clothes to wear. My life will be easier if I don’t have so much stuff. I am aiming for a simpler, less hectic, and more intentional life. That’s the target I need to keep my eye on. That’s the goal that I’m aiming for. And to that end, here is today’s declutter: Two boxes and one bag of old business documents, a stack of magazines, and an old science workbook that I never used for my first three kids so I probably won’t use it for the last one – headed to recycling tomorrow. A wooden salad bowl set that I intended to paint. 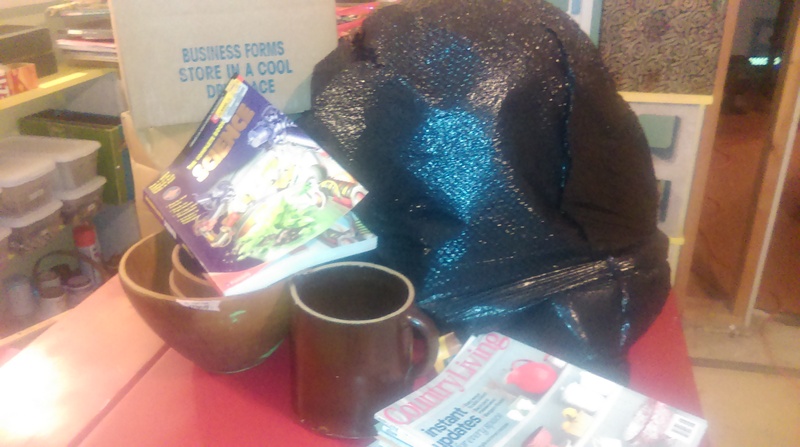 Never got around to it – time’s up – heading to the thrift store along with an antique crockery pitcher. I’m already looking around for tomorrow’s discards. Happy de-cluttering!